My husband is the best. Did you know that? Because he is. Apologies to all of your husbands, but mine takes the cake. I had a super disappointing and frustrating day today – the sort requiring a straight line towards ice cream and a nap. I had planned to make dinner, but Shane convinced me to let him treat, so we pedded up to Jolly Pumpkin. I don’t remember if I’ve mentioned JP here before, but it’s quickly becoming one of my favorite places to eat out in Ann Arbor. The food and drink are consistently excellent, and we can usually enjoy both without breaking the bank. The founder of the brewery is vegan, and as a result the menu features exceptional vegetarian and vegan options – in fact, I don’t think I’ve had meat there yet, though I have enjoyed two delicious and filling tofu salads. Tonight we opted to split an appetizer and a pizza along with our drinks – a beer for Shane, and a lovely strawberry-balsamic cocktail for me. Our appetizer was a trio of dips – hummus, edamame, and red pepper walnut – served in a perfect ratio to rustic pieces of flatbread. I particularly liked the simplicity of the hummus, which really allowed the flavor of the chickpeas to come through. Our truffle pizza arrived as we scooped up the last bites of dips – not a minute too soon. And oh, was it lovely. 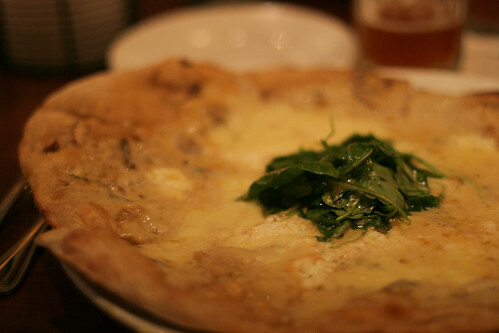 Three rich, salty, gooey cheeses covered a thin layer of creamed shiitake mushrooms, with a fresh bite of arugula and a drizzle of truffle oil on top. We both stopped after two pieces but looked longingly at the last two before finishing off the pie – far too big for just one person, but the right size for two to split. As Jamie Oliver would say, happy days. E, I was thinking of you the other day. S & I took a massage class for couples at Parkland. The instructor looked so much like you (minus a few inches in height and plus several years)!